Prime Minister, Transportation Minister, Israel Railways officials dedicate station, which is the first to be armored against rockets. 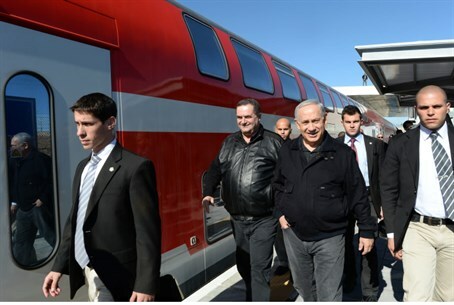 Prime Minister Binyamin Netanyahu and Minister Transportation Yisrael Katz dedicated the first train station to be armored against missile attacks in Israel in the southern city of Sderot. The ceremony was also attended by the Chairman of Israel Railways, Doron Weiss, and its CEO, Boaz Tzafrir. The Prime Minister said at the ceremony, "Today we mark a holiday, a landmark in realizing the vision to connect all of Israel - from Kiryat Shmona to Eilat." "Everything is accessible, everything is connected and it's changing the face of transportation on a practical level," he continued. "Everything we wish we manage we can do only if we keep our security." The Transportation Minister added, "There is an atmosphere here of sincere celebration because Sderot is a national icon." Sderot has been pummeled by rockets and mortar shells from Hamas terrorists in Gaza over several years. The Western Negev city was the target of a barrage of missiles during Operation Pillar of Defense in 2012. Despite this, the city continues to rebuild - even thrive. "The Prime Minister and myself have decided to connect the Negev and Galilee to the heart of this country," Katz continued. "With every train [we build] we always say that [the decision] is 'not economic.' Maybe to the Finance Ministry it is not economic, but to the residents here it is very economic!" Katz praised the construction as a "Zionist" decision as well, as one step in the larger framework to enhance Israel's transportation infrastructure. Katz has promised Sderot residents free travel on the train line for 3 months. Other groups entitled to the subsidy include the thousands of students attending the Sapir Academic College, as well as lecturers who travel to work there and residents of the following regional councils: Sdot Negev, Sha'ar Hanegev, Merhavim, Eshkol and Bnei Shimon. Residents entitled to the free transport will each be given a special Rav-Kav, or train card, preloaded with the credit. The train station in Sderot cost over 50 million shekel, and is the first to be armored against missiles. The station includes a modern passenger terminal, a 300-meter passenger platform, three railroad tracks and passages above and below ground between terminals. At least 400 parking spaces will also be built near the site. The project is being built alongside a promenade that includes a pedestrian walkway and bicycle path more than a kilometer in length, which leads from Sapir College to the station.